My colleague Candice Love Jackson recently "pulled a T. Harris." That is one way of saying that Jackson utilized time and resources in a way to generously and somehow out of nowhere provide assistance or a gift to a student. We sometimes refer to such acts of kindness as a "T. Harris," alluding to literary scholar Trudier Harris, who was Jackson's lead professor at the University of North Carolina, where Jackson earned her graduate degrees. Professor Harris is known for regularly going out of her way to support students. For instance, last year, Harris suggested that two of our SIUE graduate students participate in a seminar on Sonia Sanchez at James Madison University, and she financed our students' tuition for the program. At the time, Professor had not met our students. All she knew was that Jackson and I had students who might benefit from the seminar, so she encouraged and supported their participation. This past February, Emory University announced that Professor Harris had funded a Dissertation Completion Award in honor of student James W. Richardson, Jr. (1964-2011). Yesterday, Jackson pulled a T. Harris by presenting our black studies contributor Danielle Hall with an edition of Katherine Dunham's memoir A Touch Of Innocence (1959). 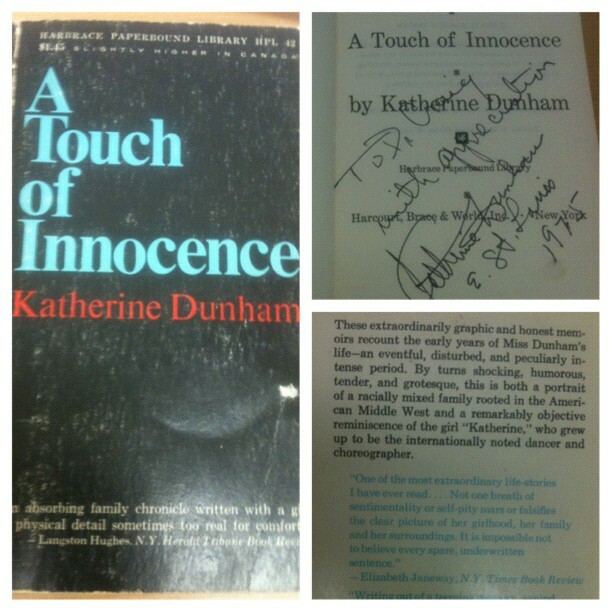 Notably, the book that Jackson acquired contained Dunham's autograph. Jackson purchased the book last weekend at an auction. Who knows how much she paid? Danielle is a serious up and coming Dunham scholar, so she was surprised and quite pleased by the gift. It's not every day that you stop by your professor's office and receive a book by your research subject that also contains her signature. Danielle is now the proud owner of a wonderful collector's item, and I'm thinking Jackson should take pride in the fact that she pulled a T. Harris.